Today, we have a number of different site updates to talk about, ranging from changes to the guide listings to the addition of guest voting and a visual update of the site's god pages. Let's get straight to it! Over the years, we have made several improvements to the order of builds & guides presented in our guide listings, to ensure that all of our users can easily find the most up-to-date resources our site has to offer. One notable change in this regard was the separation between different seasons. However, after closely reviewing the guide listings over the course of the current season, we felt we could do better, which is why we're making a few additional changes. From now on, guides and builds will be mixed and ordered by patch, which will help readers by quickly letting them know which guides are relevant to the current SMITE meta. Each guide will receive a tag showing the version of SMITE from when the guide was last updated. There will also be separate tags to let readers know which entries in the list are a full guide, as well as an "in-depth" tag which shows for guides which consist of 5000 characters or more. Entries will be sorted according to patch number first, followed by the guide score. This change is meant to reward guide authors who consistently keep their guides up to date with every update to the game, as they will now receive a higher spot in the listings over authors who don't update their guides. Note that if the god that you have written a guide for does not receive any changes in a patch, you can still update its tag simply by republishing the guide. With that said, users who are found republishing guides without properly updating them will see their guides force archived. Keep in mind that your guide score is still important as it represents the quality of your guide to your readers and it's used to sort guides from the same patch. Keep on updating your guides and make them the best they can be and you'll be rewarded with the top spots in the listings! Earlier this year, several core members of our community expressed that they feel that the scores presented in the guide listings are not clear enough, and we've heard this feedback loud and clear. However, while researching ways to combat this problem, we quickly realized that one factor which lies at the heart of this issue is that there are not enough votes being cast in the first place. Today, we're introducing guest voting, which we believe will lead to more votes being cast, which in turn makes it easier to provide clearer and more accurate guide rankings. 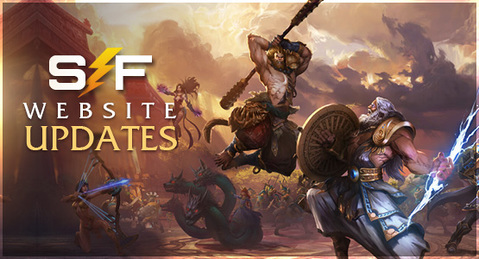 Guest votes are votes cast by SMITEFire users who are not registered or logged in. Anyone who uses SMITEFire will now be able to cast their vote on any guide. Guest votes are tracked separately from member votes and each guide will have two different scores stored internally; one based on only member votes and the other made up of member votes and guest votes combined. Only the highest of these two scores will be shown on your guide and in the listings, so the inclusion of guest votes will never lower your guide score. We already have vote manipulation protections in place, as well as requiring a valid captcha for every guest vote. We've found that fewer and fewer users are logging in to cast votes as time goes on. We want guide scores to accurately reflect the opinions of SMITEFire users, and many of those users use the site without logging in. Guest voting allows these SMITEFire users to offer their opinions on your guides, which gives guide authors more feedback on their work and, if their guide is well-received, a higher place in the listings! As said, having more votes also means more accurate guide scoring and ranking, especially for guides with very low vote counts. We're excited to open up voting to guests and get you guys more votes! Let us know what you think of the new guide scoring and voting changes coming to SMITEFire in the comments. In this new design, we've reserved a lot more space for the splash art of the god, with all info related to that god being displayed on an overlay on the left side of the image. Clicking the "Read Full Lore" option in this menu will expand this overlay to cover the full image and reveal a god's lore. Added a search/filter to the god selection which is shown upon pressing the "Add Build" button in the guide builder. We have a few more visual updates in store for you guys, which we will announce in due time. For now, please let us know what you think of these updates by commenting below! Guest voting is fine, but it is not a solution to the current representation of votes on a guide. We still need something that clearly shows the number of upvotes and downvotes on a guide. What's to stop me from going into incognito mode and mass upvoting a guide I really like? Do you have ip tracking to safeguard against this? All other aesthetic changes are nice. Well alright, that's one less worry on my mind. Also, to clarify: Guest voting not being a solution to the current problem of representation is my opinion. Others my disagree. Guest voting is going to make it even easier for people to upvote bad builds, whether it's inexperienced players or trolls. The new layout is very nice and all, but when is the upvote/downvote visual display from Smiteguru going to come into effect? Also get rid of the "new guide" thing preventing votes from showing, even in their inaccurate and over-simplistic state, especially for the bad builds that are harder to provide a large enough reason to archive. You know what, you're right. I don't like this new guest voting system. I'm with boogie. I'd love to see how many down/up votes I have on a guide 'cause this system is pretty weird. Love find your mark 15 votes and less reputation than Patience with just 7? What? First off, the positives. I really like the new god page layout and the patch organization of guides. Both are very solid adjustments...the new layout in particular really makes things feel fresh. The big negative is the voting, but it's not all negative, though I can understand the reasoning. The managers/site operators have much more in-depth information to track users. Knowing how many officially log in, and how many are "guests" is likely the biggest driver by far for this change. That said, the part that seems to look to appease regular users is that "the inclusion of guest votes will never lower your guide score." However, I think the regular user base (those who log in and contribute regularly) is much less concerned about lower guide scores, and more concerned about bad builds getting higher scores, potentially made easier by the guest voting. IP checks (if they're done regularly) are fine, but if that's not monitored well, then upvoting might get out of hand. One thing to mention is the whole thing about less voting overall. And this is where I've said before, and I've asked individuals before, and it's STILL not being done...is to get the regulars to actually vote. I don't care if you like or don't like the current voting system...if "not enough votes" wins out over "unclear voting system," then we've already lost. ...I think votes by themselves are less appealing...in the guest vote system, I think a slightly better option would be to require a comment. Could be short (at which point, if you get a lot of "great guide!" you'll have a hint maybe things are being manipulated), but also allows someone to say something that could be helpful. I'm going to guess this won't be implemented, but it's at least something to consider. Maybe the whole voting system should have the requirement for a comment, not just guests, but all votes...(that might limit votes more again...ugh). But anyway, we appreciate the continued efforts at improving the site, trust me. Guest voting is fine, but it is not a solution to the current representation of votes on a guide. In case this wasn't clear enough from my post, the intent was not for guest voting to be presented as such. However, we feel it is a step in the right direction, as additional votes are much needed to improve the current voting system, especially in regard to guides with a (very) low amount of votes. Guest voting is going to make it easier for users to vote, period, there is no reason to assume that this only goes for bad or good builds & guides. The underlying issue which you hint at is a direct result of allowing all content made on SMITEfire to be judged by everyone (equally! ), which is one of the core principles the entire site was built on. I don't think that's changing anytime soon. Thanks (to all three of you) for this feedback. This request and your previous requests have been duly noted. I understand you feel strongly about this but we're not positive a change like that would make the rankings more clear to the majority of users. This does not mean this change is off the cards, but we want to see how today's update affects the guide listings before making any further changes. One step at a time! What a guide must have to have "in-depth" below it? I believe this is mentioned in the post; the "in-depth" tag shows for all guides which consist of 5000 characters or more.